Get £5 Free With No Deposit Required for registering at Slingo Casino! Slingo Casino has just updated their welcome offer for new players at the casino which now includes a Free £5 with No Deposit Required when you sign up to their casino, the first deposit bonus match remains unchanged and is a massive 300% Casino Bonus up to £150 on your first deposit, simply make a deposit of £50 in order to claim the maximum £150 casino bonus giving you a total of £200 to play with. Along with these new changes, the casino has been recently re-designed along with a whole host of new online slot providers being added to the casino and a wealth of new unique Slingo games now on offer including Slingo Rainbow Riches! How to claim your Free £5 at Slingo Casino! Claim your free £5 with No Deposit Required by simply registering at Slingo.com, you must then enter the details for a valid Debit card but no deposit is required. First deposit bonus is a huge 300% Casino Bonus up to £150. Get my Free £5 Now! This promotion is open to new Slingo customers only. You must add a valid debit or credit card to your account to receive your free welcome offer. No payment will be taken from your card in order to receive this offer. Wagering requirements are applied by game type and are the following for this promotion: Slots x60, Slingo x60, Boom x8. Only wagering from the bonus awarded by this promotion will contribute to its wagering requirements. The maximum accumulated win using bonus funds awarded from your free welcome offer is £100. If the win is more than £100, then upon the wagering requirements being met £100 will be transferred to your cash balance and the remainder will become void. 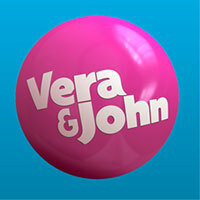 Bonus cash winnings earned from the £5 Free Bonus Cash will be valid for 7 days. 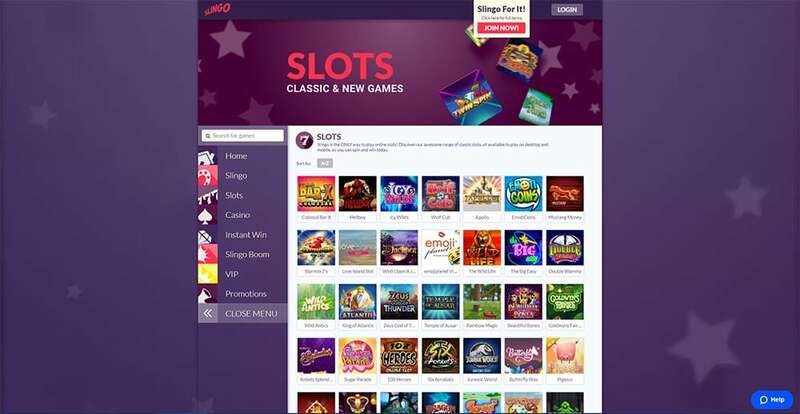 Once registered at the casino you will find a broad mix of Slingo games which now includes the exclusive Rainbow Riches Slingo as well as a massive range of online slots from big name providers such as NetEnt, Microgaming, WMS, IGT, Ainsworth, Blueprint Gaming and many more. The current Slingo range includes – Slingo Riches, Slingo Extreme, Deal or No Deal Slingo, Slingo X Factor, Slingo BGT, Slingo Reel Riches, Big Money Slingo, Pigasus, Slingo Boom and many more! 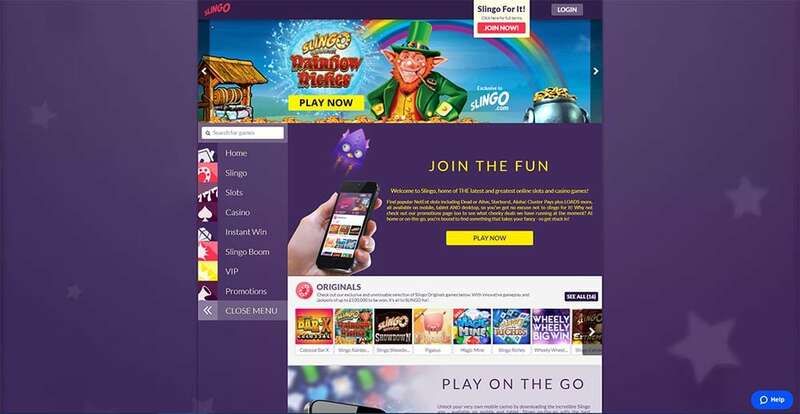 Note – Slingo Casino currently only accepts players registering from the UK and are the sister casino site to the popular Spin Genie Casino, they hold a valid license from the UKGC (UK Gambling Commission), as such you are safe in the knowledge that you are playing at a safe and secure online casino.